December seems to be a particularly difficult month for women. Maybe people in general, but I hear it most from women. Expectations, demands, schedules, emotions…they all get twisted up in our Christmas crazy culture and we lose sight of what’s really important. I wrote this in January after a challenging December. I pray it serves as a reminder to seek God first every day. Remember how you didn’t really enjoy the Christmas season last year? How the hustle and bustle overwhelmed the joy right out of you? You went all December-numb and hated it. Advent felt less like anticipation and more like obligation. Here’s the deal…no one is going to give you permission feel joy. No one else is going to force your soul to steep in moments of child-like faith. A packed calendar will fill your days while emptying your soul. Here’s an idea, mark off entire days in December before it even starts. Maybe even an entire weekend (gasp!). No plans allowed. Leave room for whimsy. Sound crazy, unrealistic, idealistic? Maybe, but so are your expectations for squeezing joy from anything other than the reality of a Savior sent. Do whatever whatever it takes to spend dark December evenings by Josh’s side. He’s your person. Disappoint your to-do list. Snuggle your girls’ sweetness for as long as they’ll let you. Open your house without planning an open house. Cancel appointments and reschedule for January…February. Put your phone away. Don’t find yourself at every party and cookie exchange if it means losing your peace in the process. Spending time is time spent. Spend it wisely. Don’t overthink your gifts. Gifts given with a heart of generosity and love matter most. Don’t overspend. It’s just not worth it. Set aside extra money to give away spontaneously. It’s fun and you feel good doing it. God loves a cheerful giver. So what if your Christmas decorations don’t look an Anthropologie display? Today’s material satisfactions are tomorrow’s garage sales. 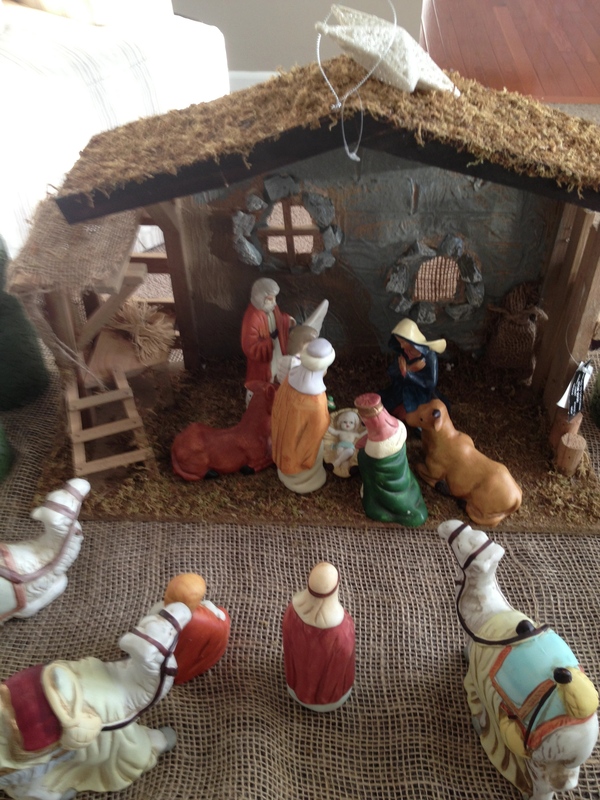 Just look at the nativity set from the elderly couple’s garage sale. It’s your kids’ favorite. They love to rearrange the pieces and since you only paid $1 for it, who cares of the shepherd is now missing legs? Focus on three traditions to uphold. Remember bigger is not always better. More is not always memorable. Your kids want you to laugh with them. Go ahead, find them funny. They love it when you’re happy, and so does your husband. It’s a gift to your family. These few weeks before Christmas will fly. There’s mystery and wonder in them if you stop and pay attention. Listen to what God is saying in moments of chaos and quiet. He’s in it all. Take time to worship Him. Remember, repent, and celebrate. If you’re not living like it’s Good News than you’re not really living. While the memories are fresh, write down what God has done in your life this year. Were there glaring moments of God’s glory you need to recount? What were your biggest disappointments? What were your biggest accomplishments? Don’t wait on this. One very short week after Christmas is the New Year and you’ll be wanting to move on and look forward. Give yourself the grace to do so in confidence trusting the past has purpose and the future hope. One last thing, in case you haven’t been told in a while, you’re enough. Even if you totally fail at all of the above, you’re still loved and known. If the sun is rising then mercies are on their way; brand spanking new. Now go grab a cup of tea and piece of dark chocolate. God is totally crazy about you. Oh this is so good to think about in March! To plan ahead to un-plan December to leave room for what God wants. My past 2 Decembers have been more home-bound than any others in my life, so this post is really good for me as the twins get older & we are able to get out more. Thanks, Jena!